Machinerie G.A.S.’s mission is to design and manufacture combined shears/press brakes and to manufacture steel parts. Through research and development of new products, the team remains an industry leader and is able to satisfy demanding clients. 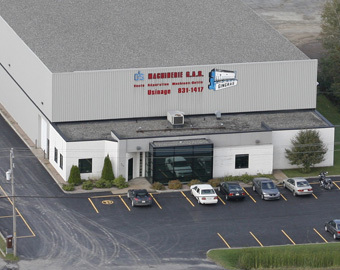 Founded in 1969 by Roger Gingras in rented premises, Machinerie G.A.S. began its activities by offering general machining and welding services. As soon as 1974, the booming business called for the construction of the first shop. In the following years, Mr. Gingras was asked to design a variety of machines, which highlighted his skill at designing and inventing new products. In 1978, he incorporates and expands the business by building a new and bigger shop, which will become too small barely two years later. This time, he decides to solve the problem by designing a machine that will combine the functions of a shear and that of a press brake. In 1982, the first prototype is operational. In the light of very promising results, he decides to patent the shear/press brake. Since 1987, this shear/press brake has been sold in North America and has acquired an excellent reputation. The team specializes in subcontracting and also manufactures the GINGRAS combined shears/press brakes, sold in the Americas and Asia. To offer high quality subcontracting services, the shop is equipped with traditional and CNC machinery, including a milling machine that can process parts up to 20 ft long, 65 in. wide and 48 in. high. The shop also includes a CNC lathe as well as a metal wire bender, among others.